The Shree Gaden Dargay Ling Monastery, a small peaceful monastery in the Tibetan settlement of Pokhara, Nepal. A peaceful environment, quite secluded from the rush of the daily life, immersed in a slow easy going aura of its own. It’s one of the major proprietors of Buddhist teachings and Tibetan influence in the country. Visitors and tourist are welcome to sit at the hour long prayer ceremony, given that you follow the instructions and maintain the level of decency required. Many encounters of tourists attending this prayer ceremony have tagged it as enchanting, spine chilling and an experience like no other. Situated inside the Tashiling refugee camp, on the outskirts of Pokhara. The refugee camp houses Tibetan refugees from times as early as the 1950’s, there is an entire generation of kids born and bought up in Nepal who have only heard stories about Tibet and hold it close to their hearts but call Nepal their homes. 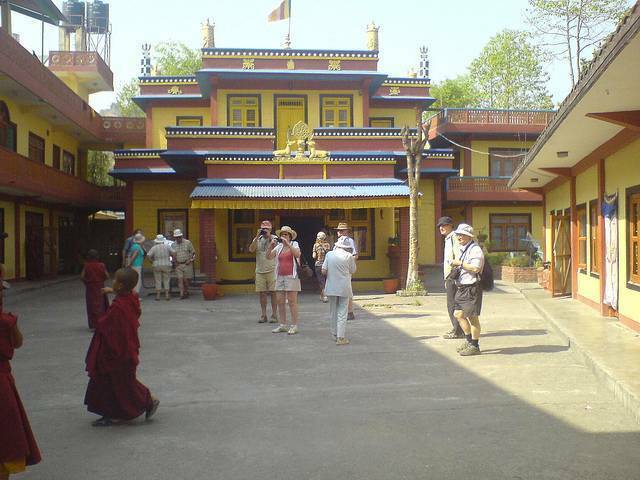 Shree Gaden dhargay ling Monastery situated in this camp adds up to the overwhelming atmosphere of the entire camp in itself. A free Tibetan refugee camp, an irony but a world within itself.